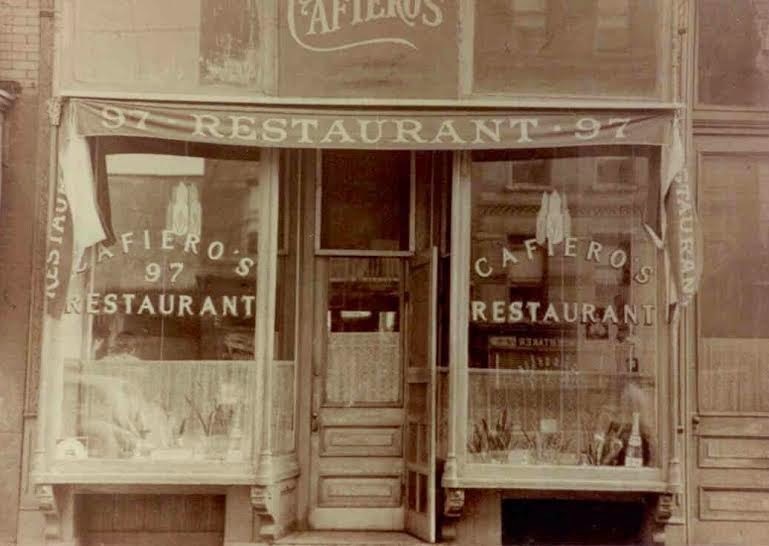 I have been chronicling the history of Cafiero's Restaurant for five years or so now and accumulated quite a cache was previously unseen, private photographs of the once-legendary Brooklyn restaurant by now. Here's a new arrival. I was told it was taken in the 1930s, when the restaurant was relatively fresh to President Street. 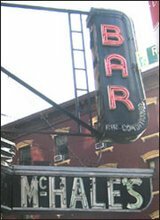 (It would last until the 1970s when owner "Sharkey" Cafiero retired and closed it down for good, breaking the hearts of many.) However, it looks just like one I have on which the date "1949" is written. Whatever. It's still one of the best photos I've seen. For more, click here. What I still lack is an actual artifact from the place: a napkin, ashtray, menu, advertisement, plate, anything. 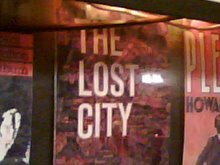 I know it wasn't the kind of place that printed menus, or advertised, or have dishware with its name on it. But I keep hoping. Looking at both of them, I think this is the *same* picture as the 1949 one, just cropped slightly differently, and with a different tint. They're both taken from the same angle, and show the same stuff inside the window, in exactly the same position. More importantly, if you look at the reflection in the window of the awning across the street, it's the same awning in the exact same spot in the window. What are the odds that anyone would do all that twice, a decade apart? every thing has been changed with the passage of time.we should also save our old things like buildings n cars.in past people use horse carts for journey but now a days they have other transportation means like taxi.it is also available after a call. we also have a tension free taxi service Detroit airport taxi at your door step.